This illustration shows the scale and comparative brightness of Pluto’s small satellites, as discovered by Hubble over the past years. 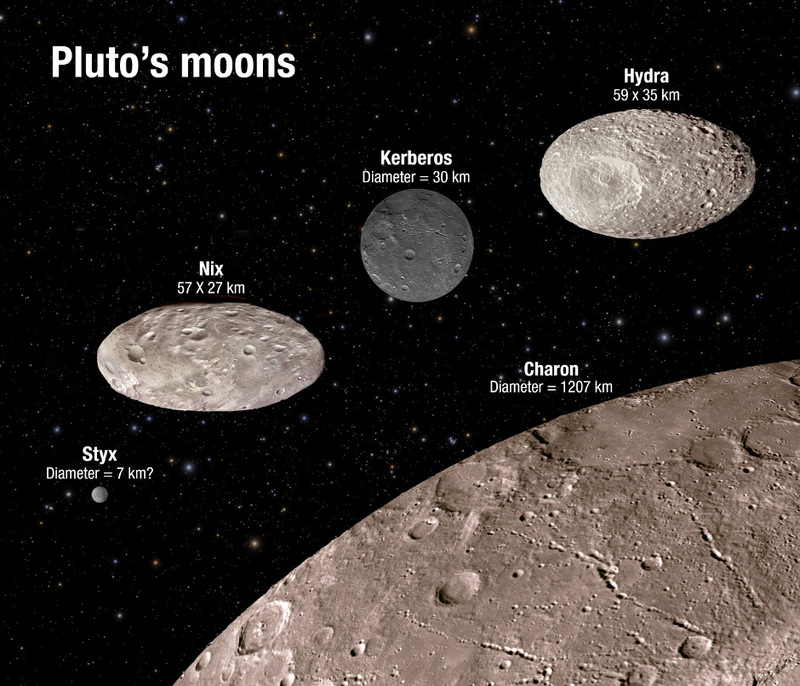 Pluto’s binary companion, Charon — discovered in 1978 — is placed at the bottom for scale. The image illustrates that two of the moons are highly oblate and that the reflectivity among the moons varies from dark charcoal to the brightness of sand. As Hubble cannot resolve surface features on the moons the textures seen here are purely for illustration purposes. Image credit: NASA, ESA, A. Field (STScI). In a new study, scientists have gathered all available NASA/ESA Hubble Space Telescope data on the four outer moons of Pluto to analyse the system in more depth than ever before. The observations show that at least two of Pluto’s moons are not neatly rotating on their axes but are in chaotic rotation while orbiting around Pluto and its companion Charon. The study also hints that one of the moons has a mysterious jet-black colouring. These surprising results appear in the 4th June issue of the journal Nature. Almost every moon in the Solar System, including our Moon, rotates on its axis at the same speed as it orbits its parent body. It is for this reason that we always see the same side of the Moon facing us on Earth. On Pluto, however, astronomers have now discovered that there are no hidden sides to its moons. In a surprising new study, it has been found that two of Pluto’s moons, Nix and Hydra, are in a chaotic rotation. This means that an observer on Pluto would not see the same face of the moons from one night to the next. For visitors on the moons themselves, things would get even more confusing, as every day would be a different length to the one that preceded it. The other two moons studied, Kerberos and Styx, will likely be found to be chaotic too, pending further study. “Prior to the Hubble observations, nobody appreciated the intricate dynamics of the Pluto system,” explains Mark Showalter of the Search for Extraterrestrial Intelligence (SETI) Institute in California, USA, main author of the study. This nine-frame animation illustrates how Pluto’s moon Nix changes its spin unpredictably as it orbits the “double planet” Pluto-Charon. The view is from the surface of Pluto as the moon circles the Pluto-Charon system. The animation is based on dynamical models of spinning bodies in complex gravitational fields — like the field produced by Pluto and Charon’s motion about each other. Astronomers also found that Pluto’s moon Hydra also undergoes chaotic spin. The rugby ball shape of both moons contributes to their wild motion. The consequences are that if you lived on either moon, you could not predict the time or direction the Sun would rise the next morning. The moon is too small for Hubble to resolve surface features, and so the surface textures used here are purely for illustration purposes. Image credit: NASA, ESA, M. Showalter (SETI Institute), and G. Bacon (STScI). 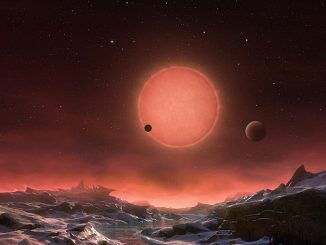 Clues to the Pluto system chaos first came when astronomers measured variations in the light reflected off of the two small moons. Looking at images taken by Hubble between 2005 and 2012, the brightness was found to change unpredictably — instead of following a regular cycle — in a way that could only be explained by chaotic movement. These images also showed that the moon Kerberos is charcoal-black in colour, a stark contrast to the bright white of the other moons. It was predicted that pollution from dust blasted off the satellites by meteorite impacts would coat the moons, giving their surfaces a homogenous look, but why Kerberos is black is a mystery. The chaotic rotation of the moons was not the only surprise that arose from the study; Hubble’s monitoring also revealed a connection between the orbits of the three moons Nix, Styx, and Hydra. The chaotic movements found in this fascinating system do not necessarily mean that it is on the brink of flying apart. More studies are needed to determine the long-term fate of the Pluto system. The researchers agree that a combination of monitoring data from Hubble, a close-up look from NASA’s New Horizons space probe, which flies by the system in July 2015, and, eventually, observations with the NASA/ESA/CSA James Webb Space Telescope will help to settle some of the many mysteries of the Pluto–Charon system. 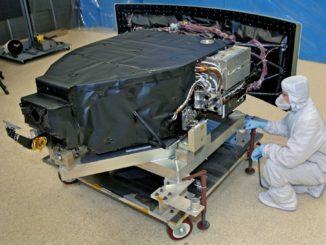 Engineers are troubleshooting a hardware problem with the Wide Field Camera 3, one of the Hubble Space Telescope’s premier science instruments. 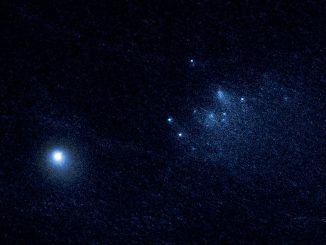 The sharpest, most detailed observations of a comet breaking apart have been captured with the NASA/ESA Hubble Space Telescope. The images suggest that the roughly 4.5-billion-year-old comet, named 332P/Ikeya-Murakami, may be spinning so fast that material is ejected from its surface. The resulting debris is now scattered along a 3,000-mile-long trail.